In 1986 India, Mukta is a ten-year-old girl who was born into a long line of temple prostitutes. Tara is 8 years old, living in Bombay with her parents. In an attempt to save Mukta from her destiny, Tara's father brings her to stay with them and the two girls form a strong friendship. But in 1993, Mukta is kidnapped from their home. Tara believes her to be dead, but 11 years later she learns that Mukta is alive, and she begins her search for her friend. 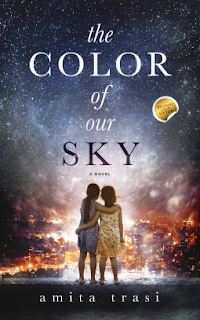 The Color of our Sky: A novel set in India by Amita Trasi is a heartbreaking story of two girls whose lives are on divergent courses, yet their connection is never broken. The novel is told in the alternating voices of Mukta and Tara, each girl telling a bit of the story of their relationship when they were together and their experiences since the kidnapping. I personally enjoyed both stories, although Mukta's life, while sad and horrifying at times, was more interesting from a reader's perspective. It's an emotional novel that reveals details of the Devdasi tradition in which young girls are "married" to a temple and become prostitutes for upper-caste men in the community. What makes this a more difficult read is that this is not a historical novel. This practice continues today in some areas of India. The physical and emotional abuse that Mukta and the real women who inspired this story face every day is heartwrenching. I highly recommend The Color of our Sky to anyone who enjoys an emotionally charged book that opens your eyes to another world and makes you think. Themes of friendship, family, tradition and human rights make this an excellent selection for book clubs as well. This review was based on a copy of The Color of Our Sky that I received from Pump Up Your Book in exchange for an honest review. This post includes Amazon Affiliate links. If you purchase something using my link, I will receive a very small commission but your price does not change. Do it! It's so good! I always appreciate book reviews. It gives me more insight into the book. Have a great week. I always read reviews before decided whether to read a book. Ack! Totally forgot. But luckily it's a flexible readathon so I'll start reading tonight!!! I hadn't heard of this one yet. It sounds good but tough to read emotionally. Thanks for the review and for posting it on the Big Book Summer Challenge!